I've had my Breville BES800es for a few months now with unpressurized breville replacement baskets. I've had reasonable success with the single basket - I can get the shot to come out in the ballpark of the correct flow rate and manage to bring it to a standstill if I try hard enough. With the double basket (which I see is generally recommended) I just can't get the shot to come out slow enough. I'm tamping with a cheap tamper that doesn't quite fit the basket snugly which is the same size as the stupid plastic tamper that comes with the machine (i.e. it's say 1mm short of being a tight fit) - tamping with enough pressure to just about give me an injury. Do I need to invest in a better tamper that fits the basket snugly - or is the basket a problem? I see Krups baskets have less holes in the bottom (tampered) versus the breville double which is just a square shape. I see threads on people saying you don't need to tamp very hard - but with this machine I don't see any other option than to tamp with extreme pressure? If the flow of coffee is too fast it could be that you are not grinding fine enough. Which Smart grinder do you have? Is it the BCG800 or the newer BCG820. To get the 800 to go finer than the adjustable settings, you may have to add one or more shims under the lower burr. To get them for free, phone Breville. The 820 can be adjusted finer than where it is set by adjusting the upper burr. The nut holding the lower burr in is on a left hand thread so turn it clockwise to remove. Hi Barry - thanks for the tip I might have to give them a call! It's the 800 - I just find it hard to believe I can have it on the max setting and it's still not even in the ballpark of where it needs to be. How fine is too fine? It is too fine when you get little or no flow. Try to standardise your dose and tamp and adjust the grind to get a desired flow. If the tamp is inadequate or uneven you can get channelling through the puck resulting in it being weak under extracted. Make sure you use freshly roasted beans too. 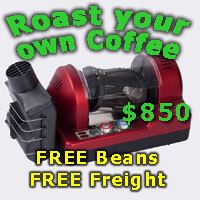 If you are using supermarket beans you may struggle as you will have to grind much finer. Yeah no problem on the beans - like I said I don't have a problem with the single basket there just seems a bit difference in requirement between the single and double? Nope. Single shot baskets will require a coarser grind. This is the same with most single shot baskets on many machines that I've used in the past. This will be why the shot looks good with the single but not the double. Generally, stick with the double shot basket. Much easier to learn on and produce quality shots. The BCG800 even on the finest setting can sometimes still not be fine enough for what you need. Call Breville and they will send you the shims for free. They come with instructions on how to fit them as well. Be careful once you have them installed not to turn the adjustment dial too fast otherwise you can slip teeth on the adjustment gear and throw everything out. That's what happened to mine, i was using it with the indicated setting at below the halfway line and I couldn't get it to physically go any higher. Needed to pull it apart to reset the teeth.